Neuromonitoring is a broad term that essentially accounts for the essence of neuroscience nursing. Nurses working with critically ill, neurologically impaired patients should have a foundation in not only in invasive neuromonitoring, but the more subtle aspects of care. Nurses must understand that they are the most important tool in monitoring patients and interpreting the data. 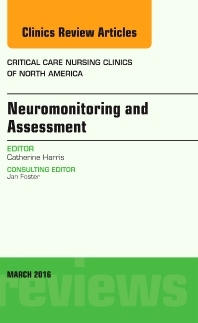 This issue of Critical Care Nursing Clinics will bring together the critical aspects of neuromonitoring in the intensive care units that can be used as a resource for nurses. Some articles included are devoted to Temperature Targeted Management; Refractory Intracranial Pressure Management; Blood pressure monitoring controversies; Invasive Neuromonitoring; Neuroradiology Review; Nursing Monitoring of Critically Ill Neurological Patients; Case Studies in EEG monitoring; and Neuromonitoring in the Operating Room.